← The Stellium Handbook is Finally Here! If your chart features the slower-moving planets (Saturn, Uranus, Neptune, or Pluto) strongly, and especially if you have a conjunction of two of these planets or a stellium that contains one or more of them, the ebooks described below will help you understand their role in your chart and explore ways to change difficult patterns they represent. The Outer Planets and Inner Life, V.1: The Outer Planets as Vocational Indicators. (Newly-released 2014 edition) If your stellium has outer planets in the career houses (2nd, 6th, or 10th), or if it relates to your chosen career, this book can give you helpful insights. There’s an otherworldly element when the outer planets are career markers, a sense of serving a greater purpose in human history. Each chapter of this e-book explores one of these planets in depth. See an excerpt here. The Outer Planets and Inner Life, v.2: Outer Planet Aspects to Venus and Mars. (Newly- released 2014 edition) Learn about the love lives of people who have the outer planets woven in with the primary relationship planets, Venus and Mars, or in the relationship houses—the 7th, 8th, and 5th. We’ll identify persistent relationship patterns for each outer planet influence. Explore the ways people with these chart factors try to satisfy their need for intimacy while still fulfilling an equally strong urge to participate in the evolution of our world. See the table of contents here. The Outer Planets and Inner Life, v.3: Aspects between the Outer Planets. (Newly-released 2014 edition) Some of the most eventful and memorable historical eras happen when two or more of the outermost planets—Saturn, Uranus, Neptune, or Pluto—form aspects to one another. We’ll look at distinct 20th Century eras like the 1960s, the astrological patterns of that time, and the life-long impact of these combinations on people born with them strongly featured in their charts. The book includes chapters on people born with the Pluto-Uranus conjunction, those with Pluto and Saturn in aspect, those with Uranus and Saturn in aspect, those with Neptune and Saturn in aspect, and those with Uranus and Neptune in aspect. See the table of contents here. 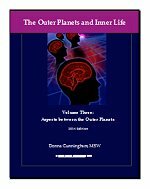 The Outer Planets and Inner Life volumes are $15 each if purchased separately, or $35 for all three—a $10 savings.